It’s a pleasure to introduce to you a lady who does it all, please meet this month’s Rockstar volunteer Jan Bischoff. Jan, moving from Oklahoma where she was a teacher for 30 years, came to Phoenix to be closer to one of her two sons. Looking to get plugged in somewhere in her community, Jan found HCC and has been faithfully volunteering her time for the past four years. 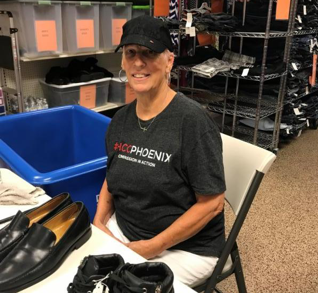 Jan is a food shopper, a clothing shopper, helps in the back sorting and processing, volunteers at all our special events and now is a lead volunteer running processing at HCC Maryvale on Fridays. Jan always has a smile on her face, loves to share her latest movie review, and often brings her grandkids with her, teaching them the importance of giving back. When we asked Jan what her favorite part about volunteering at HCCs is, she replied, “Meeting a lot of people, from guests to volunteers. Also, being a witness to them and praying and talking with them about Jesus.” She encourages others to come volunteer and see how HCCs are meeting clients at the door with compassion! Jan also expressed that her time spent volunteering at HCCs has helped her open up and grow in her boldness with her faith. Come meet Jan any Wednesday or Friday at HCCs, she’ll be wearing her favorite Kansas City Chiefs jersey and would love to welcome you at the door! Thank you, Jan, for your obedience to serving your hungry neighbors, you are loved and treasured! 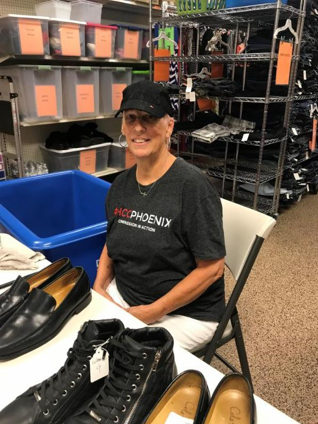 If you’re interested in volunteering at HCCs across the Valley, please contact our Volunteer Coordinator Adrie Olson at aolson@msfcares.org. Amazon will donate 0.5% of your purchase directly to MSC! MSC is now registered with AmazonSmile and would love for you to help us spread the word. Lower your tax dollars AND help feed your community at the HCC! © 2019 Harvest Compassion Center. All Rights Reserved.